Heat 9: (GER 4, ENG 2) Niss 4, (? unknown England rider) 3, Heinrichs 2, (? unknown England rider) 1. Heat wins (4 points): Fritz Niss won all three of his heats, Claussen and Andersen (two wins each), Krons and Rice (one heat win each). Christian Weber writes : Two riders represented each nation, but the second German rider, local ace Willy Brand had a fall in an earlier race with Spencer Stratton. While Stratton recovered and rode on with a shoulder injury, Brand was taken to the hospital with a broken upper arm, and therefore could not take part in the team event. 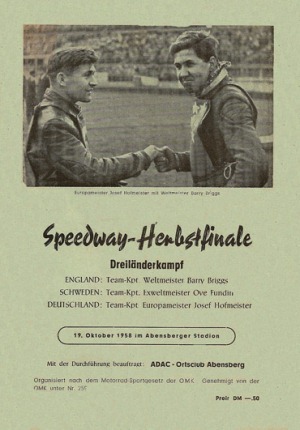 That left Herbert Drews as a German one-man-team, who had to ride in all three heats and did score a match winning 9 point maximum. Spencer 'Smokey' Stratton did ride for England, but with his injured shoulder from that collision with Brand, failed to score as he crashed a further two times in the international team event. Heat 2: Drews, Clausen, Stratton (fell); Time: 103.3 sec. Heat 3: Drews, Hoyer, Plevin; Time: 98.2 sec. Heat 3: (GER v ENG) Jervis 5, Franz 3; Drews NF, Simpson NF. (Time: 1:16.4) ENG 5, GER 3. Heat 1: Lees 3, Sörensen 2, Roth 1. (Time: 1:15.2)  GER 1, DEN 2, ENG 3. Heat 2: Rumrich 3, Hansen 2; (Jervis ret). (Time: 1:17.6)  GER 4, DEN 4, ENG 3. Heat 3: Lees 3, Roth 2; (Hansen ret). (Time: 1:15.4)  GER 6, DEN 4, ENG, 6. Heat 4: Jervis 3, Sörensen 2, Rumrich 1. (Time: 1:15.8)  GER 7, DEN 6, ENG 9. Heat 5: Sörensen 3, Roth 2; (Jervis ret). (Time: 1:14.4)  GER 9, DEN 9, ENG 9. Heat 6: Lees 3, Rumrich 2, Hansen 1. (Time: 1:16.4)  GER 11, DEN 10, ENG 12.